The Salomon Sight is the evolution of the now discontinued Ace and makes for a very good entry level or low cost all mountain board. This has the same mostly camber hybrid camber profile as the Man’s Board but a much more mellow flex for beginner to intermediate riders. If you are an advanced to expert rider on a budget, this isn’t a bad choice either. Its sweet spot is more for the intermediate to advanced rider but it won’t disappoint if you push it. 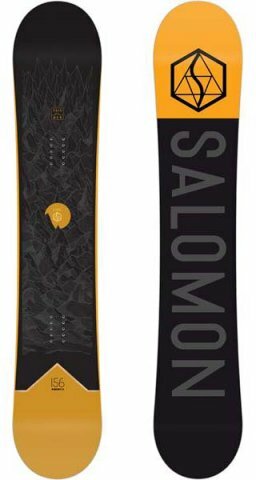 The Salomon Sight is a mellow little brother to the Effect which is a great all mountain starter board and it isn’t even bad for those intermediate/advanced riders that are on a real tight budget. 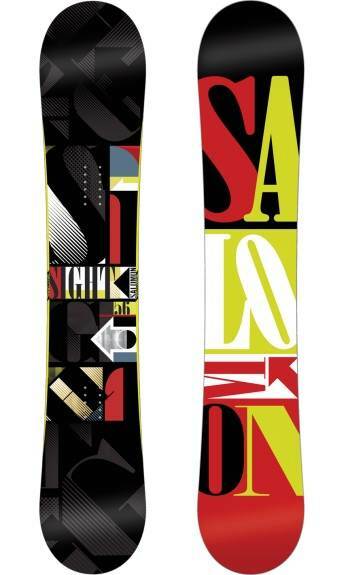 On Snow Feel: Fun for a board of this price to ride around the mountain. It lives on the side of the mostly camber hybrid camber. It has that camber feel with a little more forgiving ride. It has a mellow camber feel that’s forgiving compared to camber but catchy compared to most hybrid profiles out these days. It will allow you to learn how to ride the mountain and prepare you for boards with more consequence. It’s also good for learning the pipe and hitting a jump or two. Powder: There is a little set back of -10mm and the hybrid camber helps a bit but it’s not a super easy powder board. It’s less work than Camber but when it gets deeper it will require some work on your back leg. Speed: A step slower than the Effect mainly due to the extruded base and softer flex. This is good for perfecting a straight line and better than most 299 boards. Uneven Terrain: As the day gets chewed up an the groomers turn into the emerging stages of moguls the Sight can handle it pretty well till last chair. Flex: A nice soft flex that leans to the medium side of things. Jibbing- Not the best rail jib board but a little better than the Effect. This is more for learning the mountain but you can hit the jib park with it. Pipe: This is a good beginner pipe board. It’s not the best because of the mostly camber hybrid camber but it’s for sure the most technical at this price range. It can get a little finicky if you aren’t doing things right though. This is one of the better beginner all mountain boards that will put you on the pathway to a more aggressive ride if you learn correctly. We try to get as many images of the Salomon Sight, but forgive us if they're not all there.